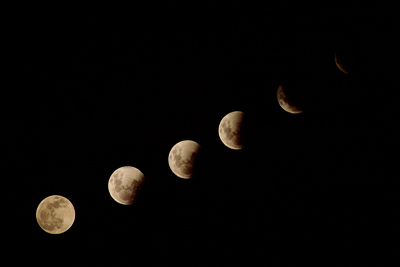 Every 6 months, there is a two week period that is like a great cosmic changing of gears, called the ‘Eclipse period’. This is a fateful fortnight between the Solar and Lunar Eclipse, a time of decision when major issues tend to arise. For some, it is a time of crisis, whilst others find it a turning point that springboards them more easily to greener fields. Eclipses bring changes – a getting rid of the old before the new can come – similar to ‘an opening of the gates’, so to speak. They synchronise with major shifts in consciousness – often with a collective experience – a shift in vision on a higher level for our planet. The duration and type of Eclipse determines its effect and this exists until the next one. The actual day may not be that effective, but the eclipse point is triggered every time there is any kind of celestial activity aspecting that point. At these times, the gate is opened up a little bit more. Eclipses can act as a seed for future change – where we ‘suddenly see the light’. So they can be seen as ‘spotlights’ shining on the pathway of your life, illuminating a particular area of your life which may have been pushed to one side or shoved under the carpet. You are being allowed to see the issues in your life which may be holding you back, or hindering the fulfillment of your chosen destiny or fate. Your decisions about how you deal with these issues can have major consequences. The strength of the eclipse period’s impact depends on where it falls in your birth chart. For different parts of the world, the effects tend to be expanded if the eclipse path crosses that area. Eclipses can also seem like ‘wild cards’, stressing emotions or bringing chaotic events. At times, they can even have little apparent effect. There is a phenomenon referred to as an ‘Eclipse Season’, when the Transiting Sun applies by 19 degrees to the Nodes and continues until the Transiting Sun separates by 19 degrees from the Nodes (this takes about 38 days). Research has shown that if an Eclipse forms a conjunction, opposition or square to a personal point or planet in a chart (using a 2 degree orb), then events predicted can manifest at any time within this Eclipse Season. The intensity (i.e. 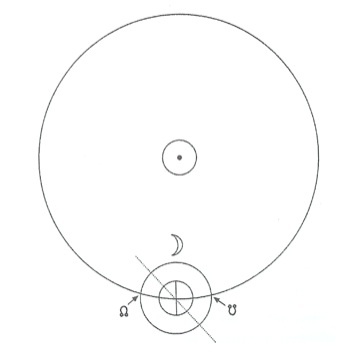 an annular, partial or total) of the eclipse is determined by how close to the Nodes the Sun/Moon are, and also by the length of time the eclipse lasts. Nodes are the points on the ecliptic where the orbits of the Moon and Earth intersect. An Eclipse occurs when the Sun and Moon form either a conjunction or an opposition within 19 degrees of either of the Nodes of the Moon. Eclipses change the earth’s electromagnetic energy field, as well as our own personal fields. Since the human nervous system works by tiny electrical charges flowing through the nerve fibres and the brain, interesting behaviour can develop during this period. It certainly does seem that some people can become quite frazzled and entrenched in crisis at this time. Astrologers generally expect more clients to visit them during eclipse mania. Some people can literally ‘flip out of their tree’, particularly around the Lunar Eclipse Full Moon time. (The Full Moon can affect the flow within the body, which is made up of 70% water, just as it affects the earth’s tides.) Despite the Eclipse’s historical bad reputation, some wonderfully powerful things can crop up if you are in tune with its energy. A Full Moon is the tension that takes place when the Moon tugs in direct opposition to the Sun, with the Earth in-between. It symbolises the end of a cycle (a fruition time), especially when the Full Moon is also a Lunar Eclipse (about every 6th Full Moon is a Lunar Eclipse). A SOLAR ECLIPSE occurs when the Moon passes between the Earth and the Sun. It occurs at a New Moon when the Sun and Moon are in conjunction. A New Moon occurring within 19 degrees of the North/South Nodes can be a partial solar eclipse. If between 0 and 9 degrees it is a total solar eclipse. Many of those attitudes do not really fit our true inner selves, so we spend the rest of our lives striving to shake off the areas of conditioning that do not really sit well with us. 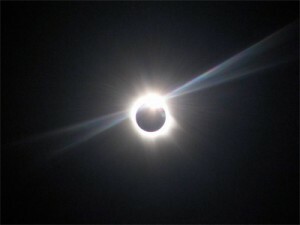 It is generally felt that the effects of eclipses are in proportion to the duration of the actual eclipse; e.g., a total Solar Eclipse of 4 hours equals 4 years; a Lunar Eclipse of 3 hours equals 3 months. A LUNAR ECLIPSE (the Moon moves into the Earth’s shadow cutting off the light of the Sun to the Moon) occurs at a Full Moon when the Sun is exactly opposite the Moon. The orbs are smaller here – if a Full Moon occurs within 12 degrees of either the North/South Nodes then a partial lunar eclipse occurs. If within 0 to 4 degrees of either Node then is it a total lunar eclipse. The Sun crosses over the Nodal axis twice a year, once over the North Node and 6 months later, over the South Node. Thus in any given year, there will be two eclipse seasons. The Nodes travel backward through the zodiac, taking about 19 years to complete their cycle. They can magnify the potential of any planet they are contacting whether transiting or natal, and can often show time and place of a climax. A New Moon Solar Eclipse often has a more external effect, dealing with actual events or situations in our lives that we have not consciously precipitated but often in an area where new seeds are being sown for the future – whilst a Full Moon Lunar Eclipse deals with more emotional and internal issues – pondering the problems of life and so on – often associated with events brought about by our own thoughts or feelings. Lunar eclipses create a shift in emotional perceptions often around relationships. The Eclipse period, when the Sun & Moon do their little ‘dance’ together, is meant to be a cleansing period, when you can shake off just a little more of that conditioning, on the path to discovering your ‘true soul self’. It can be quite a traumatic period for those who have been heavily conditioned, whilst it is usually easier for those who have broken away from old patterns. Often our roles as parents are spotlighted, as well parent-child, teacher-pupil relationships, where a shift can tend to take place. However, one of the most famous eclipse effects is in the romantic relationship area. (Imagine if an eclipse fell on St. Valentine’s Day on your Venus in 5th or 7th!) This is a time when the air is charged with romantic electricity and we may find a rash of new romances can blossom or others crashing at this time. This ELECTRO-MAGNETIC energy is almost tangible. Electronic equipment operate on electromagnetic energy, and they may seem to go a little crazy at eclipse time. Most of the news we hear comes via these mediums, and it is interesting to look at the world news at this time and spot the trends. Eclipses can bring up issues around father, mother, parenting, children – to subtle romantic relationship substitute types. Eclipses can certainly bring up the old stuff, in order to be resolved a little more. Sometimes a rash of disasters can hit the front pages. Eclipses are literally points in time when the solar principle of decision can be brought to bear upon the lunar principle of unconscious memory – they are times when we are offered an opportunity to consciously shake off old habits and ways of feeling, and reach out to grasp more joy in our lives. Here are some “Eclipse Tips” that can help you deal with any Eclipse period effectively and keep you fresh and alert. At this period the atmosphere is charged differently with more positive ions. The air and energy around can feel a little tense, frazzled etc. in the same way as you feel a sense of foreboding as a storm builds, filling the air with positive ions. Then the rain pours down, increasing the negative ion ratio, making you feel refreshed and revitalised. So water helps a lot, washing off the positive ions clinging to you, to surround you with a more negative charge. You can feel less frazzled, more refreshed and ready to cope effectively with the eclipse energies. Take LOTS OF SHOWERS – 3 a day if necessary – a dip in the pool is good eclipse therapy or you might feel like jumping under a pyramid structure to meditate – a lot of the pyramid shape’s miraculous reputation can be attributed to the way it cleanses and strips away the positive ions. An Eclipse sensitises any degree in which it occurs, such that when a Transiting/Progressed or Solar Arc Planet hits that point, activity associated with the eclipse may manifest. The most potent transiting/progressed or solar arc planets over an eclipsed degree are Mars, Saturn, Pluto and Uranus. It is also important to note that with Eclipses, if conditions are right, events can often take place prior to the eclipse. Eclipses often synchronise with major shifts of consciousness – a collective experience – awakening people globally. Each Solar/Lunar Eclipse season, expresses the characteristics of the Saros Series to which it belongs. There is strong evidence to support the idea that the ‘development of human thought in a particular field’ is linked to a particular Saros Series. As a Series moves through a chart, it will produce an eclipse very similar in expression approximately every 18 – 19 years. You may then experience one of these eclipses directly affecting your chart. Eclipses can occur in a set of three, but usually in sets of two, with one being a solar eclipse of either type (North or South Node) and the other being a lunar eclipse of the opposite type. These take place within two weeks of each other. For solar eclipses, the eclipse degree is where the Sun/Moon conjunction takes place. For lunar eclipses, the eclipse degree is the degree of the Moon. North Node eclipses, both lunar and solar, tend to bring increase and expansion. This can be either positive or challenging, meaning it can bring people what they want or unexpected benefits, or it can cause too much of a good thing and bring on unwanted stresses. South Node eclipses tend to bring endings, subsequent vacuums, but expansion later because the past has been cleared away. In other words, North Node eclipses are regarded as harbingers of the future, whereas South Node eclipses bring closure on the past.